App submitted to Palm Catalog! Fixed bug which required users to launch preferences first and then enable map view in order to view timetable schedules. 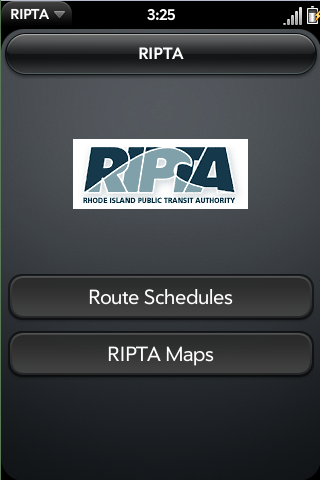 It's a program that gives you a nice mobile interface to the RIPTA website schedule finder. It shows all the routes and their schedules, as well as their schedule maps. It also has a map of Kennedy Station, Downtown Providence (Detail), and Rhode Island System map. All of these are available from the website. Any bugs and/or added functionality would be extremely helpful. Note: It is a little big because I chose to put the map files locally within the app instead of downloading them off the website and slowing it down. Let me know if it would be better to have it directly downloaded and I'll do that instead. I'm releasing this under GPL v3. Please feel free to modify it and share it if you will. The only thing I ask is leave the email link on the bottom and please try to keep me updated on what changes/modifications you have made. I will give credit where due. Thanks.